Spies, intrigue, secret knowledge, and the pursuit of limitless power - these are the themes assigned to Dead Drop, a micro card game that tasks players with deducing a very important piece of hidden information before an opponent can do the same. Each player is an agent is racing to "discover the unknown" by sharing and selling secrets, gathering information, and ultimately confronting the hidden information for a single shot at glory. 13 cards, 2-4 players, 5 minutes per game. Do you have the courage to peek into the unknown? 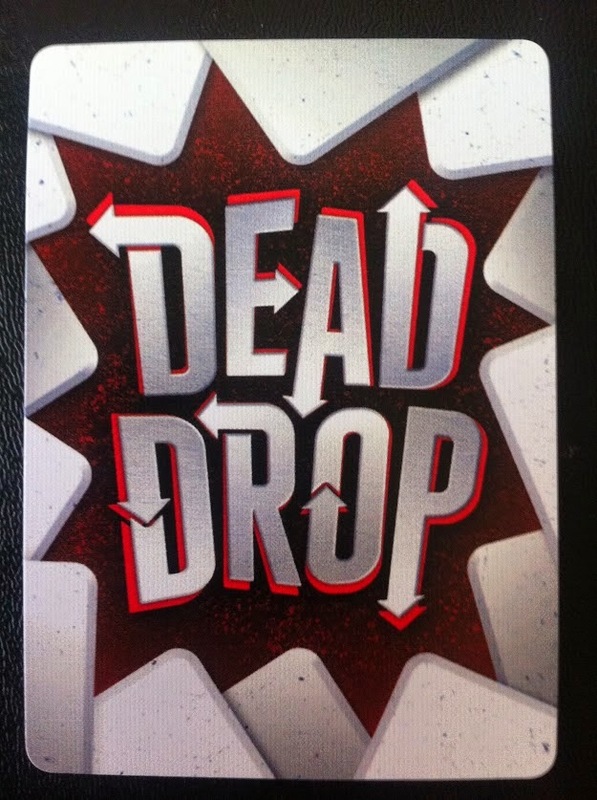 Full disclosure: I received a copy of Dead Drop from Patrick Nickell, founder of Crash Games and publisher of Dead Drop. I was asked to review this game honestly and wasn't compensated for doing so. In Dead Drop, players are competing to be the first to win three rounds. Players can win a round in of two ways: either by correctly guessing the value of the hidden card, or by being the last player alive in a round. At the beginning of each round, a single card is placed face-down in the middle of the table. This card represents the "secret knowledge" players seek. A number of cards equal to the number of players (2, 3, or 4) are placed face up in the middle of the table, and the rest of the deck is dealt evenly to the players. 1) Share Info: Give a card to another player, and receive a card from that player. Both players choose which card to exchange before seeing the card they receive. 2) Swap The Stash: Take a face-up card from the table, and replace it with a card from the player's hand (a different card than the one taken from the table). 3) Sell Secrets: Reveal 2 cards from hand to another player (secretly). If that player has a card with value equal to the sum of the shown cards, it must be given to the active player. The active player then gives the other player one of the secretly-revealed cards. Example: Say I'm playing Dead Drop with Donny. I want to know if he's got the "5" in his hand, because if he doesn't, it's a sure bet that it's the secret card we're all trying to guess. I show Donny a 4 and a 1 from my hand. If he has the 5 in his hand (4 + 1 = 5), then he must give it to me. If he does, I choose to give him either the 4 or the 1 that I've shown him. If he doesn't have the 5, nothing happens, and he says "No" out loud so other players (in a 3-4 player game) are aware of the result. After every turn, the active player may choose to guess the hidden card's value... but there's a catch. In order to guess a number, the player must reveal two cards that add up to the value guessed. So, if I want to guess the card is a 5, I have to reveal a 1 and a 4 (or a 2 and a 3) before my guess. This is one of the cooler pieces of design I've seen in a micro game. The way to make a good game out of a limited number of pieces and cards is to introduce a "hook" that makes a game interesting. This is what hooked me, and what I think provides the depth that makes Dead Drop worth buying and playing. It's not enough to know all the information - you've also got to set up your hand so you can make your guess. This is a subtle thing, but adds a layer of strategy that turns 13 cards into a game I've already spent hours thinking about. The term "abstract" is often used to describe the separation of theme and mechanics in a game. A game is considered perfectly "abstract" if the theme can be completely removed from the game without impacting the experience players have while playing. Think of Chess (yes, Chess has a theme) as a great example of this, or many of Rhiner Knizia's card games. A game like Battlestar Galactica or Betrayal at House on the Hill is the exact opposite - theme drives those games, even with interesting mechanics present. Dead Drop is an abstract game, and that's ok. The art is nice (Adam McIver's work is always excellent), but it's an addition that isn't required to play the game. You could whip up a deck on index cards, or my writing over playing cards, and I don't think the experience would be any different. If you're the kind of person who loves theme and art - well, you'll enjoy this, as even the prototypes I received look really nice. If you've been accused of beep-booping every game you play (my technical term for card counting and calculating odds constantly in games), then you'll pretty quickly start thinking about the information puzzle Jason has designed - and it's a pretty neat one. The object is to be the first player to get the "unknown cards" number to 1, and have two cards in hand that add up to that card's value. (Of note: the "5" card can be used as a "0" for purposes of guessing the center card. I think I can hear the playtesting conversation from here). There's a set distribution of cards (four 0's, three 1's, two 2's, two 3's, one 4, one 5) that allows you to pretty quickly deduce which cards could be in the center, and make decisions about how to share and gather information based on that. For instance, if I have two 0's in my hand, and there's another face-up on the table, then I can deduce that the remaining 0 is either in my opponent's hand or is the secret card. I could Share Secrets and present my two 0's to my opponent and ask for her 0. If she doesn't have the 0, then I know the middle card is a zero, and I win (assuming we're playing a two-player game). However, there's only a 1-in-6 chance that this happens. It's much more likely (83.33% likely, in fact) that my opponent is holding the 0, and will hand it to me. If that happens, what's happened to our balance of information? I have eight cards in the "Known" column (my hand, the two face-up cards, and the 0 I just traded), but my opponent has nine cards in the "Known" column, because I revealed two cards. That balance is offset on her turn, when she's presented with the same series of choices that I am. Still, she now has a lead, as she only has four cards to deduce instead of five. For the moment, she has an informational advantage, one that could win the game if used correctly. I've only played two-player games so far, so I can only speak to the experience of playing heads' up against a ruthless assassin who wouldn't think twice about eliminating me to gain otherworldly knowledge (my wife, obviously). Dead Drop feels like a cerebral battle in head-to-head mode. Every time I give up information, I'm necessarily putting my opponent closer to solving the problem, and if I guess wrong, she wins automatically. For a card-counting, puzzle-loving, wizard-playing nerd like me, the intensity generated by this problem-solving race is pleasant. I'd play this game at the Dead Drop of a hat with friends who similarly enjoyed the puzzle of it. Patrick and Crash Games are marketing Dead Drop in their "Pub Games" series, and I think that's a pretty good fit. Card games of deduction aren't for everybody (seriously, some of my friends can't stand playing Noir) and games that require a good memory and a knack for odds aren't always best to mix with beer. Still, Dead Drop takes up very little space, is easy to explain, and should be a great fit for people who like puzzles and want to carry around a card puzzle in their pocket. I'd like to write a strategy guide for this game, but I'm holding off until after it funds and I've had a chance to play a few dozen games with two, three, and four players. For now, I encourage you to check out Patrick's Kickstarter campaign for Dead Drop. It introduces a type of puzzle I haven't experienced in a card game before, and it's designed well enough that after four or five hours of thinking about best plays I haven't "solved" the game. Good work by Jason Kotarski and his playtesters deserves to be rewarded, so go take a look at the game and let me know if you want to play sometime!